The Board of Inquiry (BOI) set up by the Ghana Armed Forces (GAF) to investigate the controversy surrounding the sale of its scrapped aircrafts to Pink Aviation Services (PAS) has revealed that the bunch of top officers, who were in charge of the auction, lacked the necessary expertise - hence the scandal. The seven-member board, also noted that notwithstanding any mistakes or lack of authority on the part of the Ghana Armed Forces personnel, unless it could be proved that the buyers were aware of such mistakes or lack of authority, there could be a valid contract between the GAF and the buyers. “Therefore, the purported unilateral cancellation of the sale by the GAF could amount to repudiation and thus breach of contract. The rejection by Pink Aviation Services of the cancellation of the sale by the GAF implies that PAS still regards the contract as subsisting and could, therefore, sue upon it,” the report said. The report observed that if the government or its agencies decided to operate on the ordinary commercial market, they were bound by the ordinary rules of the law of contract, however, where a fundamental error had been made, the government should be able to legitimately take steps to defend the national interest. The board, in its six-page opinion, noted that the officers did not exert themselves adequately to ascertain the initial and current values of the Skyvans, adding that failure to ascertain, in base values for the aircraft, fundamentally flawed the disposal process. It was the opinion of the seven-member Board of Inquiry that after the Survey Report, instituted by the Air Force headquarters to take inventory of the state of the aircraft, there should have been another board to assess the value of the aircraft and the spare parts. 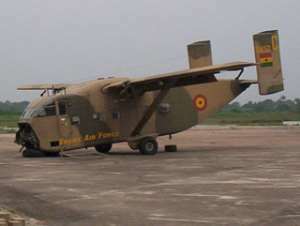 Another highlight of the BOI report was that there was a communication gap between the Air Force and the auction board, because even though the Air Force headquarters knew that spare parts and other supporting technical equipment were to be disposed off, along with the aircraft, the auction board knew they were selling only what they had seen at the Air Force stations in Accra and Takoradi. The report noted that what the auction board saw were airframes, unserviceable engines and other loose parts that were in the hangars. The report further stressed that there was a general lack of clear meaning to basic terminologies, such as “scrap”, “scrapping”, “decommissioning” “casting”, “beyond economic repair (BER)” “obsolete”, “assessment of repair capability” “repair” “parts” “spareparts”, etc., adding that the absence of a glossary for these terminologies generated much confusion in the process of disposing of the aircraft. “… Describing BER aircraft as “scrap” whereas the real import was that it would be uneconomic to repair, appears to have sent the wrong signal to auctioneers, buyers, the general public and eventually affected the value that was placed on it. The report further noted that the security arrangements made to cover personnel of Pink Aviation Services while they were repairing the aircraft at the Air Force Station in Takoradi was lax and inadequate. The board, in its findings, explained that the process of disposal of the aircraft started in mid 2002, when the Chief of Air Staff directed the Air Force Headquarters to assess the state of all aircraft on the inventory of the Air Force, with the view to making recommendations for refurbishment or replacement. The inventory, according to the report, revealed that the Skyvans were in a “high state of un-serviceability” and that there were difficulties in procuring spare parts for the maintenance of the Skyvans and their airworthiness. It further indicated that after several processes were followed, the Chief of Defence, who is the final approving authority for casting and disposal of technical equipment, approved of the casting of two Skyvans and 12 L-29 Dolphin aircraft. But the BOI report said that the auction board did not strictly follow the established procedure for disposing of equipment in the Armed Forces, because they failed to confirm the current values of the items before disposing of them. “The Auction Board did not fully comply with the terms of reference, in that it did not ensure that the sold aircraft were to be reduced to scrap, instead the Board accepted contradicting conditions from Pink Aviation Services without authority,” the report indicated. The contradictions being raised by the BOI was that Pink Aviation stated in its bid that they wanted to be given an opportunity to repair the Skyvans, because they thought they had the technical expertise to bring the aircrafts back to flying The report, also indicated that even though the Air Force separately stored spare parts and other detached parts for preservation, the auction board was not briefed about these items and therefore did not know about their existence. It added that the briefing did not also indicate that three of the engines on G450 and G452 were serviceable. The board noted that many favors were extended to Pink Aviation because the closing of the tender was postponed twice to enable Pink Aviation to put their bid and also the fact that it was the only company which had access to the report of Board of Survey. The first postponement of the bid, according to the report, was on December 10, 2003, whilst the second was on December 13, 2003. The BOI report also picked serious issues with the fact that Pink Aviation Services was the only bidder which was privy to the Board of Survey report before putting in a bid. The BOI noted with concern that Board of Survey Report was a classified document and that the possession of the report was illegal. For this particular action, the report said that approval was not sought nor given for the acceptance of the bid conditions of Pink Aviation, especially because it carried security implications. The report, however, did not state whether any of the bidders had requested and was denied the Board of Survey report because it was classified. According to the report, CTK Aviation Network, operators of a local airline called City Link, had also intended to repair the aircraft and use them for domestic flights and training if they had won the bid. The BOI report said if CTK had won the bid, it would have had a more positive impact on our national economy. The composite bid meant that Daniel Ossom submitted one bid for both the Skyvans and the L-29 Dolphins.